Here's all the pictures from the cottage last weekend. Anne surprised us by coming up by herself for some family time. Istra would command "Auntie Anne no car!" whenever Anne'd get into her car to get something: Istra was afraid she was leaving. Lots of Selena's family came over for lunch, ostensibly to celebrate her graduation (any excuse to see Istra and Emeth!). A best-of is on flickr. Including Istra watering her horsie. The osprey. And clouds. 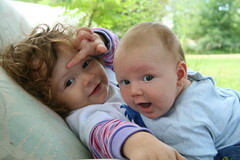 i love the pictures of Istra with her little brother! :) very adorable! beautiful children! Tim, those cloud pictures are wonderful! I love photographs of clouds and the ones you have with the lake and sky are simply stunning!